With how hot it gets in Florida, our air conditioners are a vital part of our daily lives. When it’s not working properly, it can turn a house into a sauna. Today, we’re going to discuss five clear signs that your air conditioner needs to be repaired. If you recognize any of these signs in your own air conditioner, you don’t need to suffer through the heat. Instead, call Altman’s Cooling and Heating to schedule an appointment and get it fixed as soon as possible. Our talented and experienced team will get it back up and running so you can feel comfortable in your home again. One of the clearest signs that your air conditioner isn’t working properly is when you have hot air coming out of your vents when it should be cold. It might not even be hot air — maybe just warmer than you’re expecting — but this is often a sign your system needs serious repair. It can be the result of a few different issues. For example, it could mean that the air conditioner’s compressor is failing, or it might be a symptom of a Freon leak. No matter the reason, an air conditioner pumping out hot air means it isn’t doing its job and needs to be fixed. When your air conditioner is running, does it feel like hardly any air is coming out, even on its highest setting? This usually means one of a few different things is wrong, one of which is a failing compressor — something that can create a number of problems. However, if the issue is certain rooms or parts of your home get cold air while others don’t, it is a sign that there is a problem with your ductwork. Whether that means there is a leak or some sort of obstruction is difficult to tell, but an HVAC professional will be able to deduce the source of the problem. When debris gets stuck in your vents and ducts, it doesn’t just create air flow issues. It can also affect your home’s indoor air quality, which can lead to health problems for you and your family. Many times airflow problems are accompanied by inconsistent temperature issues. While it might be caused by an issue with the compressor or your ducts, it might also be a problem caused by your thermostat. Something that many people overlook when dealing with air conditioning issues is how their thermostat is working and where it is placed. If it is placed in an area of your home that is warmer than the rest, it will read a higher temperature. This leads it to tell your air conditioner to work harder and pump out colder air to overcome that heat. When that happens, it might be a comfortable temperature in the room with the thermostat, but other areas of your home will be much colder. This strains your air conditioning system more, which can reduce its lifespan while resulting in higher energy bills. Ensure your thermostat is operating properly and is not in a room with a lot of sun exposure or heat-producing appliances. You might also want to consider upgrading to a programmable thermostat. If you notice water or other signs of moisture coming from your air conditioner, it’s not something to ignore. While it might be harmless water leaking — a sign of a blocked or broken drain tube — it could also be refrigerant. Leaking refrigerant puts your family at risk of health issues and is especially dangerous if small children or pets come into contact with it. Either issue should be handled quickly and by an HVAC professional to ensure everyone’s safety and health. A properly working air conditioner should be mostly silent, with just a slight mechanical sound signifying that it is running. If an air conditioner is making weird sounds — squealing, grinding, or squeaking — it’s a sign there is an issue with something within the system. This might also be accompanied by bad smells, which might mean the wiring has burned up. A cool home is a comfortable home, and that requires an operational air conditioner in a hot climate like Florida. 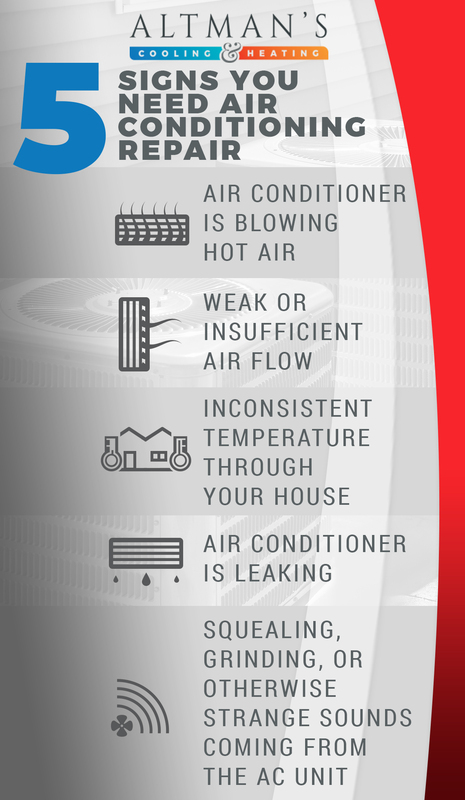 If you recognize any of these signs in your own air conditioner and need a qualified AC repair technician, call Altman’s Cooling and Heating. While we’re located in Titusville, we’re proud to serve Merritt Island, Port St. John, Cocoa, Cocoa Beach, New Smyrna Beach, Cape Canaveral, Mims, Rockledge, Sharpes, Wedgefield, Edgewater, and Oak Hill. Call us today to learn about our new customer special.